Michael was riding an electric skateboard for the first time and he thought it was a great idea but the hand held remote function caused the skateboard to jerk when speeding up or slowing down. He wanted to make it possible to control speed levels and cruise control with just his foot. Thus Cruze was born. It brings a new take on electric skateboards using a foot-controlled sensor and allows smooth and remote-less riding for those who want to have a good time without exhausting themselves. It smoothly transitions through different speed modes to keep you comfortable while cruising. Ride to work or simply for fun on this Hover-1 Cruze electric skateboard. 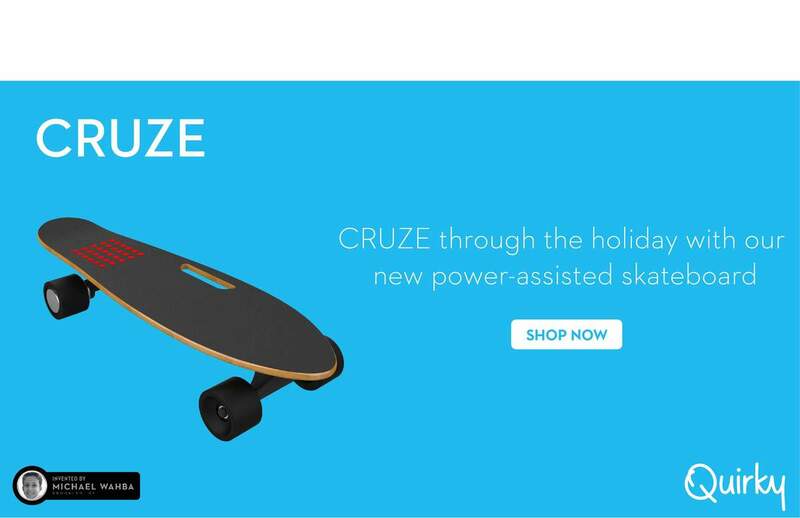 The Cruze’s patent pending design highlights a unique foot sensor to engage the motor instead of the typical remote controlled skateboards. With a charge time of 2 hours, this Hover-1 Cruze electric skateboard rides at up to 11 MPH for up to 9 miles.